As described in Introduction to DVM, managed-source and managed-load symbols can represent any number of different electrical definitions, depending on the test objective of a particular simulation. While the source and load symbols do not visibly change, the electrical definition of the subcircuit called by the symbol does change. 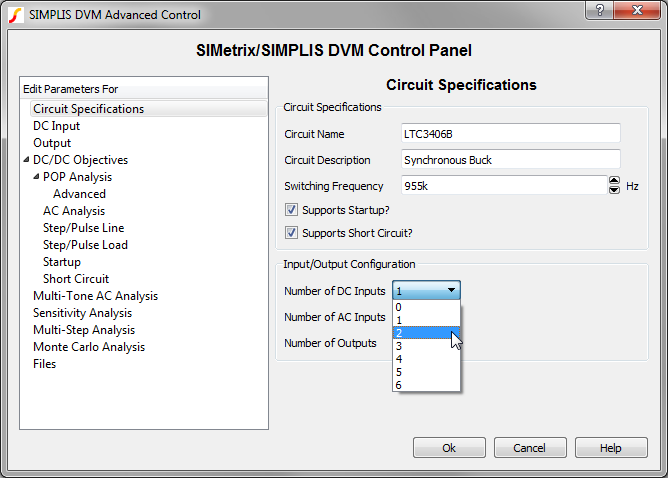 You define which sources and loads are managed using the SIMetrix/SIMPLIS DVM Control Panel that opens when you double click on the DVM control symbol. After selecting the sources and loads to manage, the reference designators (V2, I1, in this example) are saved to the DVM control symbol. You then need to edit the default specifications for the managed sources and loads. 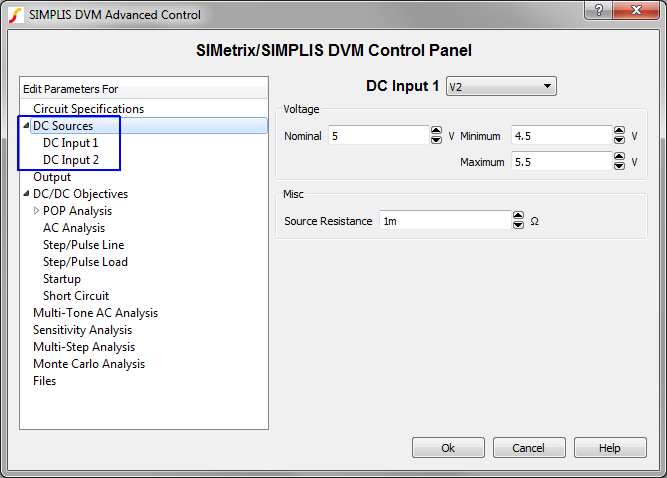 For more information, see the DVM Tutorial 3.1 Editing the Schematic topic. Custom subcircuits can be designed as schematic components and then converted to ASCII models to be used with DVM. Adding a source is described here, but the process of adding a load is exactly the same. The design starts with V2 and I1 as the source and load reference designators. 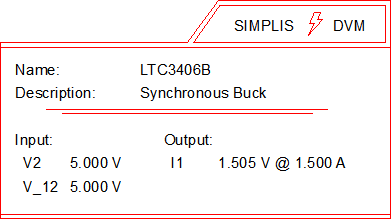 Select the number of new sources and loads from the Circuit Specifications page of the control symbol dialog. For this example, select 2 from the Number of DC Inputs drop-down menu. 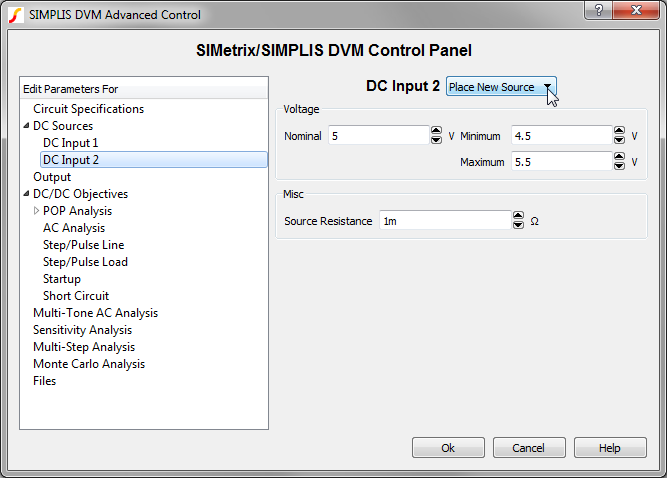 Select the second DC input source and enter the source voltage and resistance parameters. Note: DVM automatically finds all DVM input source and load symbols and if you have already placed a source or a load symbol, you can select the reference designator from the drop-down box shown above. Otherwise, DVM automatically enters a source/load placement routine after you accept the dialog in the next step. After entering the parameters, click Ok to accept the dialog. Click Ok, and place the new input source on the schematic. 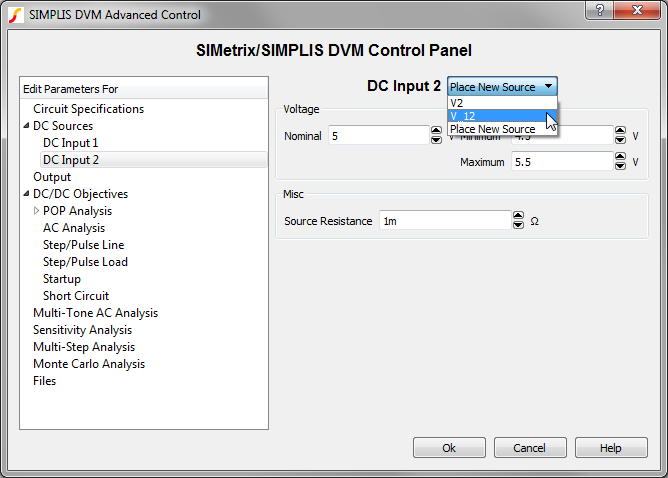 If you have already placed a DVM source or load on the schematic, you can easily add it to the DVM managed sources or loads. In this example, assume that reference designator V_12 was already palce on the schematic and you want to manage this source also. Result: The control symbol now lists both the V2 and V_12 designators. Double click on the DVM control symbol. In the page-selection box, select the source or load that you want to remove. Click Circuit Specifications, and change the number of inputs or outputs. Click Ok to save the new specifications. You change a source or load subcircuit definition using the Source and Load testplan entries.